Ballantyne Jewelers will be happy to provide you an “Insurance Replacement Estimate” upon your request for all items purchased in our store. Our Graduate Gemologists are available on staff to assist you. Whether it’s a treasured family heirloom or a relic from a past relationship, you want to know the value of the jewelry you own. Discovering what a piece is worth can help you determine whether keeping or selling it be best. It can also sometimes help you learn more about the piece by identifying metals or gemstones you might not have been aware of. Maybe you already know that you don’t want to sell a cherished piece of jewelry, but what if you want it insured? Jewelry insurance is designed to protect against the financial loss that can occur when a piece vanishes mysteriously, but you can’t have a piece insured unless you know its official value. This is where professional appraisal services come in. Here at Ballantyne Jewelers, we offer appraisal at our stores to help our customers quickly discover the value of their favorite pieces. Our gemologists will closely inspect your piece and provide you with certified documentation of its worth, which you can then use to get your insurance policy. They take a variety of factors into account when determining a piece’s worth, such as the quality of the gemstones and metals, the designer, and the current price of similar pieces on the retail market. The jewelry market is always fluctuating along with the greater economy, which means that the value of a piece will greatly change over time. 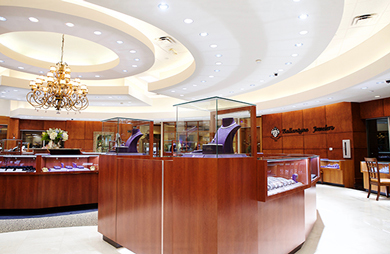 For this reason, Ballantyne Jewelers recommends jewelry appraisals every two to three years. Ballantyne Jewelers can be found at 12335 North Community House Rd. in Charlotte NC. If you have any questions about our jewelry appraisals, please contact us by phone at 704-341-4242. We hope to hear from you.